Stephen Colbert last night pledged on his TV show that he’d be taking United Farm Workers President Arturo Rodríguez up on his offer to “take back an American job” from “an illegal immigrant.” I’m not sure when Colbert is going, but I’m thinking of finding out so I can follow Colbert and report on it. 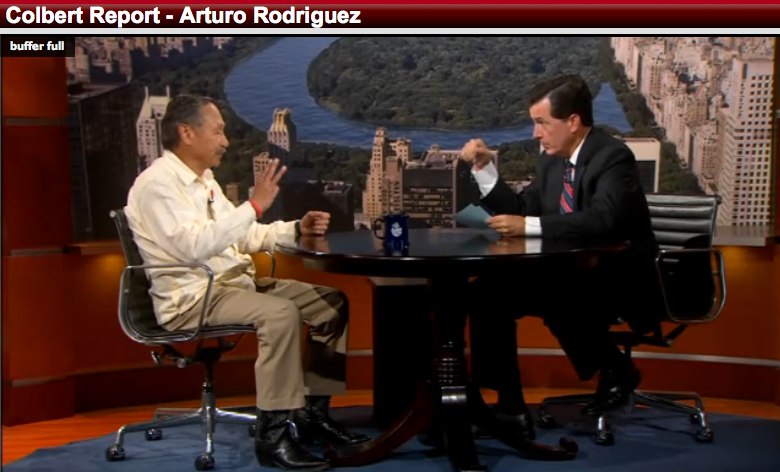 Colbert with Rodríguez on his show last night. To watch Colbert making his pledge, click HERE. But I’m also interested in seeing, up close, how Colbert’s experience will help shape public opinion. Humor and logic, combined, are a powerful force. Colbert will, no doubt, reveal the abusive, exploitative drudgery that is farm work. Colbert’s presence will also create even more publicity for the campaign and will shift the American dialogue from the nonsensical “what part of illegal do you not understand?” to conversations about creating an affordable food supply that does not rely on indentured servitude. Rodríguez is the mastermind behind the UFW’s “Take Our Jobs” campaign, which challenges anyone who wants a farmworker job, to step right up. So far, he said only three people have taken the UFW up on it. I’d like to see the unions of the poultry and meat packing industries do the same. Working in a slaughterhouse is grueling and dangerous. You come home smelling of blood and your fingers never thaw out. Oh, what’s that? Most of that industry is not unionized? Never mind. Next Post Lincoln what, Lincoln who? OMG … I worked in a cornfield one summer when I was in high school. I lasted exactly ONE DAY! And I’ve never forgotten just how miserable the work was.